The Ministry of Health and Welfare and RNL Bio Co., a Seoul-based bio venture, are locking horns over controversial stem cell operations on Korean patients in Japan and China arranged by the firm. The government is considering taking legal action against the stem cell developer for a violation of Korean pharmaceutical law that bans injections of manufactured stem cells without approval from the state-run drug agency. Officials claim the firm has evaded the Korean law because it administered stem cell injections at its partner hospitals in Japan where the procedures are allowed. So far, the ministry has sued the company for minor cases such as running advertorials in local newspapers to appeal that their treatment methods in use of stem cells has proved its effectiveness. RNL defended its overseas operations, saying it intended not to gain profits but to save patients from suffering. “Because of the local law, we can’t help but send patients overseas to administer stem cell injections,” Park Hye-rim, a publicist for the firm, told The Korea Herald. A research team at Chungbuk National University carried out experiments with dozens of mice over the past few years to learn what effect stem cells had on lifespan. A score of them lived their average span of around two years, while another score lived around half a year longer after adult stem cells were periodically injected into them from when they were eight months old. RNL Bio Chairman Ra Jeong-chan, who commissioned the experiments, said the research testifies to the correlation between stem cells and longevity, which he expects will be eventually applied to human beings. “Mice from the experimental group survived around 30 percent longer than the control group, obviously thanks to the stem cells infused every other week,” Ra said in a recent interview with Business Focus. “The former were also found to be less vulnerable to cancer, one of the major killers of mice, compared to the latter. Some were even still alive after two and a half years.” He added that the research will be featured by a foreign peer-reviewed journal later this year. The study is in line with previous assumptions of Ra ― adult stem cells not only deal with degenerative diseases like Alzheimer’s or diabetes but also help human being fight aging. In other words, he regards stem cells as the fountain of youth, which humanity has avidly sought to chalk up a victory in its holy war against sickness and aging. Korean scientists have discovered a new molecular compound that could increase the efficiency of human adult cell reprogramming to induced pluripotent stem cells. 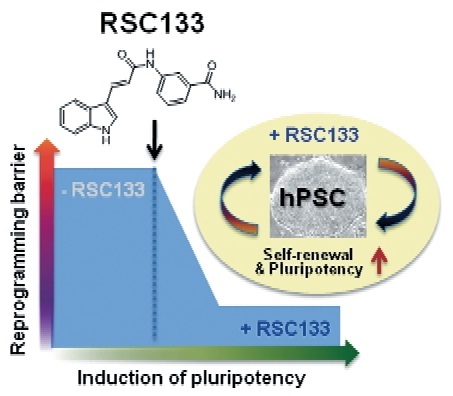 The low-molecule Reprogramming Stimulating Compound 133, or RSC133, adds to the list of non-viral vectors that are crucial to advancing the biotechnology and production of iPS cells. Dr. Cho Yee-sook and Dr. Lee Jung-woon of the Korea Research Institute of Bioscience & Biotechnology led a team of researchers for this latest discovery that was published in Angewandte Chemie International journal early this month. It said that the compound derivative acts as the “booster of pluripotency,” and it “potently improves the reprogramming of human somatic cells into a pluripotent state and aids the growth and maintenance of human pluripotent stem cells.” Pluripotent stem cells, like embryonic stem cells, can be turned into any type of cell in the body. Korean scientists reported a breakthrough technology that can more efficiently and safely reprogram adult cells to an embryo-like state, where they can grow into organs. The two research teams led by professor Park Se-pill at Jeju National University Stem Cell Research Center and Mirae Biotech succeeded in generating induced pluripotent stem cells using non-viral vectors of nanoparticles and liposomal magnetofection. Non-viral vectors usually consist of DNA that can be delivered to a target cell. The findings were featured in the latest edition of the peer-reviewed scientific journal PLOS One late last month. Professor Kim V-narry of Seoul National University is once again in the headlines producing research results published in the online version of the leading biological journal Cell for the second time in less than two weeks. In her most recent research, Kim and her team proved that the protein Lin-28A is closely involved in suppressing protein expression in stem cells. Until now, the Lin-28 protein’s only known function was suppression of specific microRNA molecules, which in turn regulate gene expression. In the previous research, the results of which were published in the online version of the Cell on Oct. 12, Kim and her team discovered a previously unknown step in the production of microRNA let-7. In the latest research, Kim’s team used a technique known as crosslinking immunoprecipitation-sequencing to identify to which RNA molecules the Lin-28A protein binds to in living stem cells. Through the experiment the team discovered that Lin-28A binds not only to microRNA molecules, as previously thought, but also to a large number of RNA molecules involved in protein synthesis that takes place on the surface of the rough endoplasmic reticulum. A team of Korean scientists are striving to develop a stem cell therapy for Alzheimer’s disease by 2016 based on their latest discovery of how to grapple with the degenerative illness. The team, led by professor Suh Yoo-hun at Seoul National University and RNL Stem Cell Research Institute head Ra Jeong-chan, said that their findings will open a new door to conquering Alzheimer’s disease. Encouraged by the positive results of the animal tests, Suh’s team applied for an approval on clinical tests on human patients. 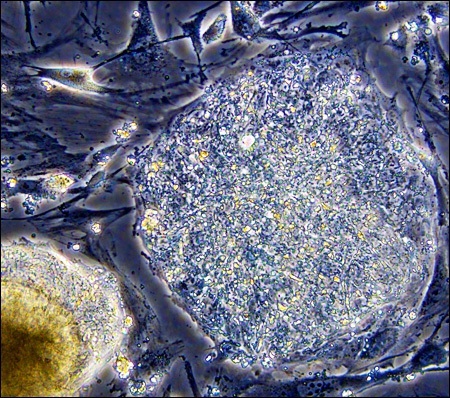 A way to revive failed livers through stem cells could be available within the next few years as clinical tests of a new treatment regimen are underway. Pharmicell, a Korean pharmaceutical company developing stem cell therapeutics, said Monday that it has submitted a plan for the commercialization of “Livercellgram,” a stem cell therapy for liver failure, to the Korea Food and Drug Administration (KFDA). The company said that it successfully completed research trials, which began in 2009, and confirmed that the therapy was effective in curing alcohol induced cirrhosis. The company will begin secondary stage clinical trials if the plan is approved by the KFDA. If the product is approved, Pharmicell will be the first beneficiary of a revised rule made by the KFDA last year which allows research trials to replace a first round of clinical trials. A 49-year-old surnamed Park was in a car accident 14 years ago on his way to do some night fishing. He was immediately taken to the emergency room and, although he regained consciousness, his body was completely paralyzed from the neck down. He also lost his sense of smell and could only move his fingers slowly up and down. Park underwent rehabilitation regimens and acupuncture in China but the efforts were hopeless. He struggled to even lift his arms. In despair, Park met professor and neurosurgeon Jeon Sang-ryong from Seoul Asan Medical Center in October 2006. Jeon suggested that he participate in clinical research targeting quadriplegics, or those suffering from general paralysis, using stem cell therapy. The research ultimately led to a curative procedure. A group of professors at Seoul Asan Medical Center led by Jeon conducted stem cell therapy research and succeeded in using stem cells to cure patients suffering from general paralysis. It is the first time in the world that recovery through stem cell therapy research has been objectively proven through magnetic resonance imaging. Doctors collected Park’s stem cells and then grew them until they had 48 million cells and injected them into his injured spinal cord. The operation took nearly seven hours and Park was put under general anesthesia. After being dismissed from the hospital, he visited the doctor twice every month to get 50 million stem cells injected into the injured area each time. Also, he was able to smell the scent of toothpaste only a week after he left the hospital. A Korean medical team said Wednesday that it had succeeded in greatly improving the condition of three paralyzed patients by injecting their own stem cells into the injured parts of their spinal cords. Headed by Jeon Sang-yong of Asan Medical Center in Seoul, the team treated 10 patients suffering general paralysis with the stem cell-based therapy and three experienced a significant recovery. The latter’s exact condition was not immediately revealed, but Jeon said they could “move their limbs on their own.” Before the treatment, they were unable to do so, and also had limited sensory feeling in their body, he said. Jeon confirmed their dramatic recovery by regularly scanning them through magnetic resonance imaging. A 62-year-old heart attack patient surnamed Kim, who was hovering between life and death, received a coronary angioplasty to open blocked arteries to his heart in April 2009.The surgery was performed at the Seoul National University Hospital. At that time, his doctor asked Kim if he was willing to participate in a stem cell clinical test that was being promoted by the hospital, and he agreed. The surgery involved a procedure of injecting stem cells taken from his blood supply into the damaged heart muscle. The operation ended after 30 minutes. After six months and two years, the stem cell clinical trial team conducted a magnetic resonance imaging scan of Kim’s heart. It was found to be improved, and it stayed improved during the following checkup period. A team of professors at Seoul National University Hospital’s cardiovascular center, led by Kim Hyo-soo and Kang Hyun-jae, said yesterday that they requested the Committee for New Health Technology Assessment under the Ministry of Health and Welfare to approve the clinical use of their stem cell therapy in November of last year. For full article see Joongang Daily.